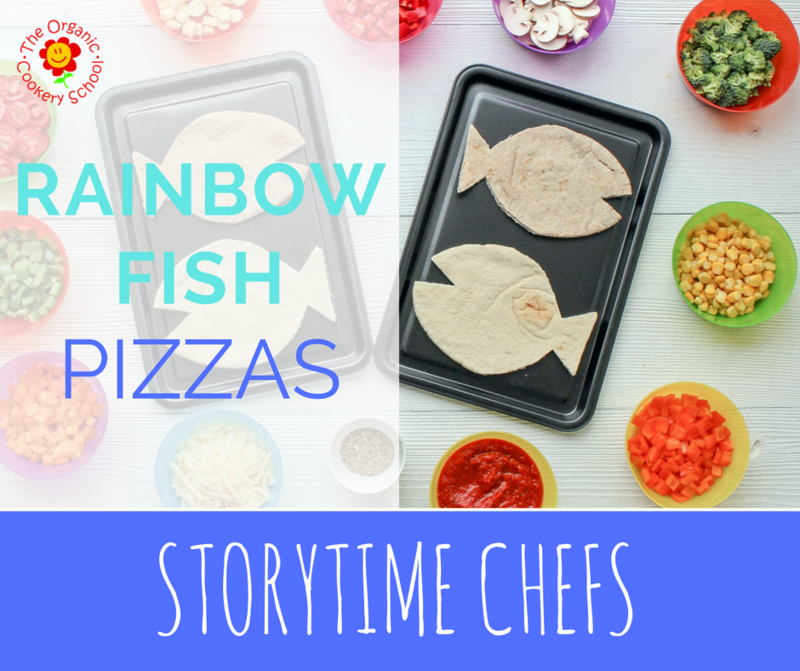 These quick and healthy pizzas are inspired by The Rainbow Fish (by Marcus Pfister), and encourage children to pile up on a variety of different coloured veggies, helping them meet their five a day targets and eat a rainbow too. I’ve honestly never seen my five year old so keen to load up with every colour of vegetable. For speed and convenience, shop-bought pitta bread works fine (Waitrose and Ocado stock organic versions). Pitta are easy to cut to shape with sturdy kitchen scissors, and both wholemeal and white pitta both taste great in these pizzas. If you want to make your own pitta (which is great fun and everso easy) - we’ve included a recipe to make your own in the resources section of our FB group. Next comes a topping of our veggie packed magic tomato sauce, but any good quality tomato pasta sauce will work (we like Seeds of Change and Mr Organic sauces). 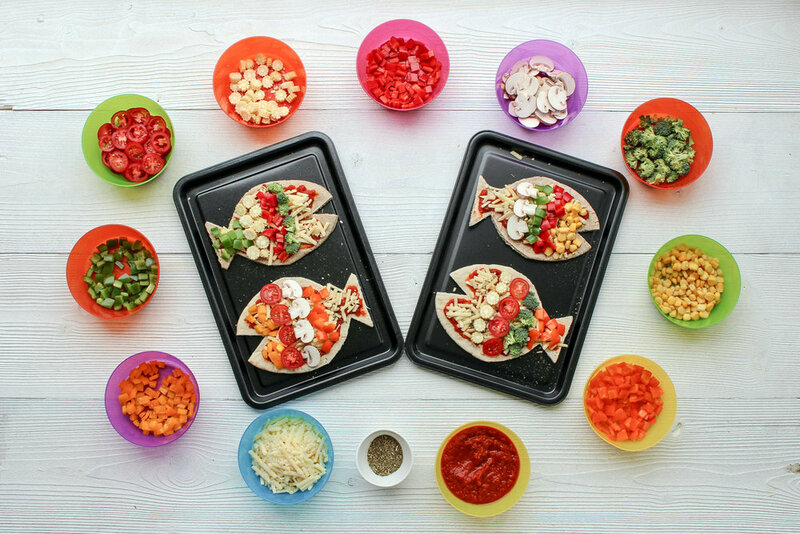 Let your junior chefs get busy with the cheese grater, minding their fingers (and fingernails) before offering them a rainbow selection of veggie toppings. 2. 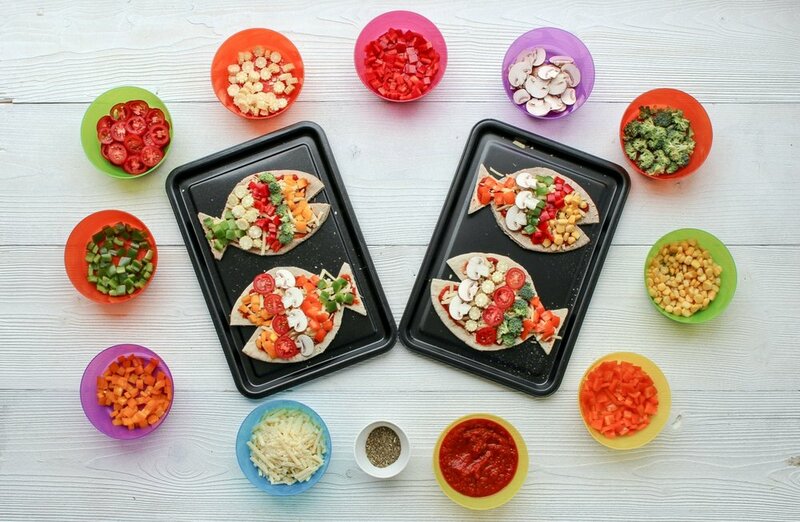 Trim pitta into a fish shape using kitchen scissors, and place on a baking sheet. 4.Grate cheese and sprinkle over sauce, adding a pinch of Italian herbs. 5. Carefully chop your vegetables into little pieces using a table knife, scissors or a child's safety knife . 6. 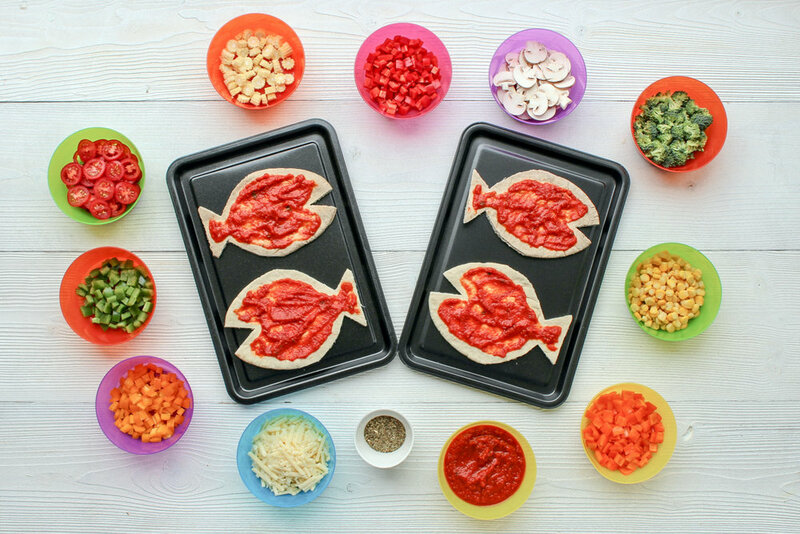 Top pizzas - go to town making your pizza fish as colourful as possible. 7. Spritz or dribble with a little olive oil. 6. Bake for 1-12 minutes until bubbling and golden brown. Allow to cool a little before eating. 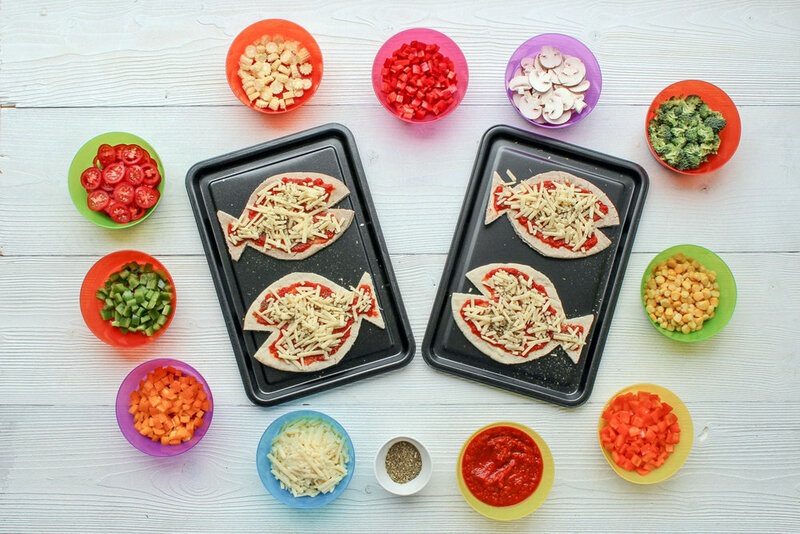 Optional: try mini pittas to make lunch-boxed sized mini rainbow fish treats. *N.B. Children should always be supervised when cooking, and an adult should oversee the use of heat as well as all preparation involving sharp utensils. Wait until cooled and enjoy. Enjoy this? Try our Rainbow Fish inspired digestive biscuits. Annual use of foodbanks is rising, so it’s bittersweet that so many of us are loosening out waistbands and still surrounded by the excesses of a typical British family Christmas. And as New Year's Eve approaches, lots of these foods will soon be decluttered to make way for healthier January fare - the boxes of Roses from well-meaning aunties, packets of dates, sugared almonds and marzipan fruits from the neighbours, the family sized tubs of Celebrations, Twiglets and Mini Cheddars, being replaced with fresh fruit and veg, salads and smoothies. Many of these unwanted treats will end up in food bank donation bins, where the basics of baked beans, tea bags and tinned veg are already shuffling for space with Christmas teas, fancy jams and endless Scottish shortbread. And whilst the estimated 590,000 people per year who rely on food bank donations may welcome some of your Christmas leftovers, there are numerous essential items, often not food related, which are in greater need. So next time you pass the food bank drop off at your local supermarket, church or community centre, please consider donating some of the following non food items too, as identified by The Trussell Trust. It’s also very helpful to check with your local foodbank as to which items, food or otherwise, they are particularly low on, or have plenty of. Many, like Exeter Foodbank, issue a monthly priority list which you can find on their social media feeds. If you and your family are struggling, you can find out more about being referred to your local food bank via the Citizen’s Advice Bureau. In 2016/17, The Trussell Trust handed our over 1.8 million emergency food parcels. They operate a network of 400 foodbanks across the UK. Lunch box staple and after school treat. These never last long in our household and are ideal to cook with little ones. Great for using up stale bread and a portable form of bread and butter pudding. Need we say more? 1. 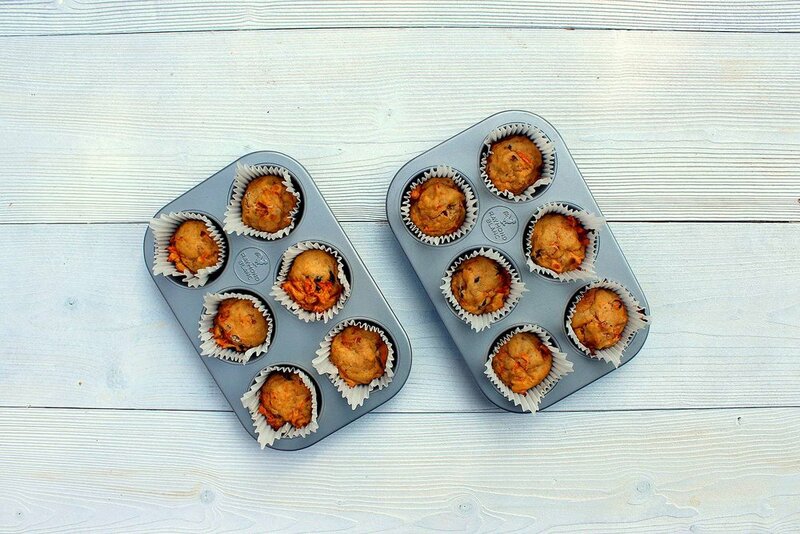 Line a muffin tray with greaseproof cases. Heat oven to 190˚C. 2. Cut bread into cubes and place in a mixing bowl. Pour over milk and cream and leave to soak in. 3. Add egg to melted butter, vanilla and sugar and mix well with a fork. 4. 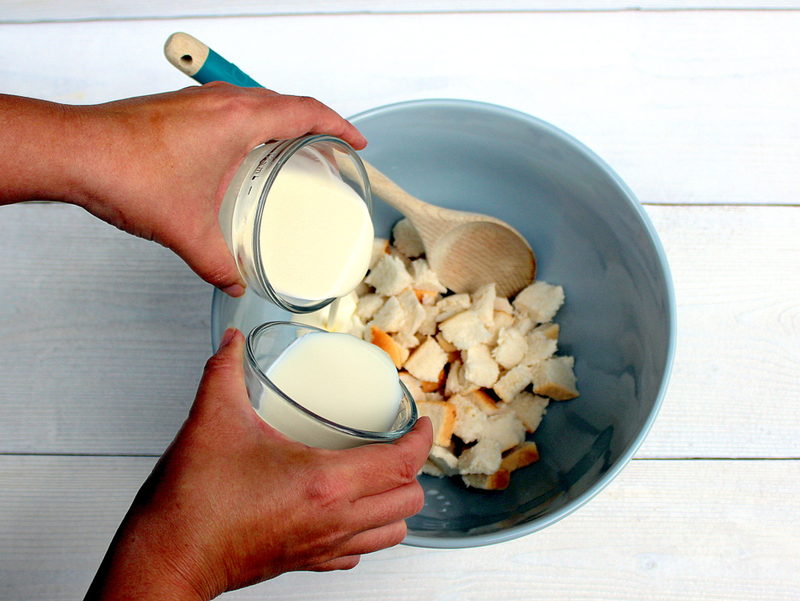 Stir through bread and cream mixture. 5. Finally, measure flour, baking powder, nutmeg and dried fruit into a small bowl and tip into your bread mixture, stirring well. Add grated apple if using. Add some nutmeg into the mixture, if using. 6. Scoop into muffin cases and sprinkle will a little Demerara sugar. 7. Bake for 15-20 mins until risen and light golden. These muffins are full of calcium (good for your bones) and contains very little added sugar because of the natural sweetness of the dried fruit. Here’s a popular dish from our Cooking with Dad project and afterschool clubs. Using cheap winter veg, tasty cheese and dried herbs, it’s inexpensive to make and delicious. You children will love getting creative with the pastry scraps too – so make sure there’s plenty left for all their decorations. 1. Put the leek, butter and herbs in a pan, cover and cook over a low heat for 10-15 minutes until very soft, stirring occasionally. 2. 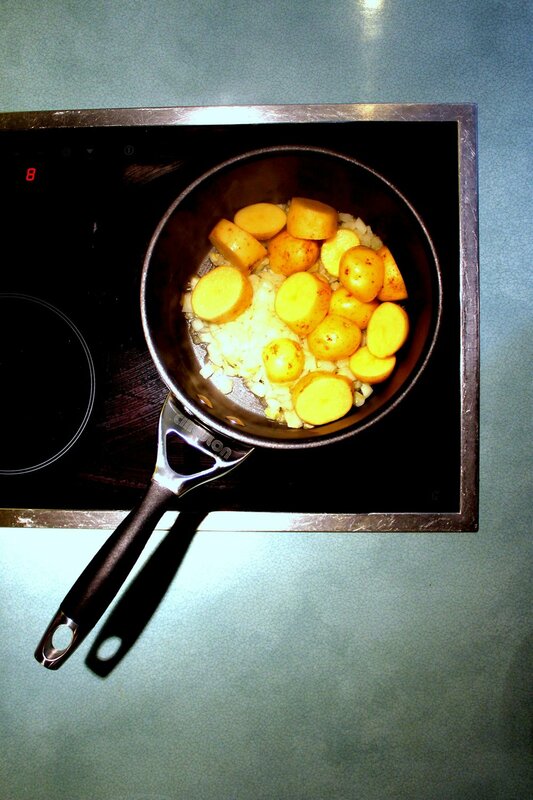 While the leeks are cooking, chop the cooked potato into small chunks, transfer to a bowl and stir in the cooked leeks. Leave to cool. 3. Stir in the cheese and season as required. The filling can now be chilled for use the following day, if required. 4. Divide the pastry in two. Roll one piece to the size of a small side plate. Transfer this to a baking tray lined with greaseproof paper. Roll the remaining pastry and trimmings to a circle a little bigger than the first. 5. Pile the filling into the middle of the smaller circle, leaving a 2cm border. Brush the border with the egg wash, then drape over the larger piece of pastry. Trim the edges to neaten, then press the sides together with your thumb or a fork. 6. Decorate with left over trimmings eg letters, leaves or hearts. 7. Brush tart and decorations with egg wash and make a couple of incisions in the top to let out steam as the pie cooks. 8. Bake at 180˚C for 25 minutes until golden. 9. Leave to rest for 10 mins before cutting into wedges and serving with beans or greens. 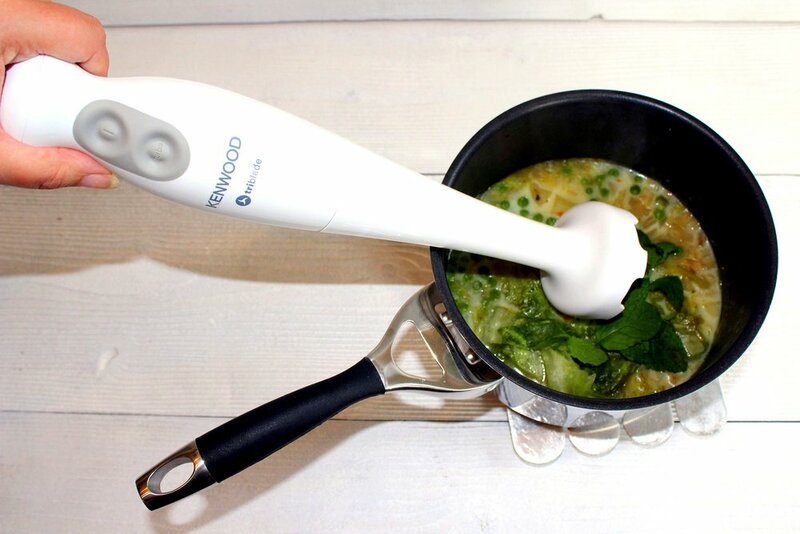 use of heat as well as all preparation involving sharp utensils. Try using alternative vegetables in this pie. Peppers, sweetcorn, courgettes would all work well. Cheese contains both protein and calcium – something we all need for growth and development. 1. Preheat oven to 200˚ C.
2. Grease foil baking tin. Place pear halves into base of cooking dish. Halve again if easier to fit. 3. Prepare your batter. Sieve flour, baking powder and cocoa into a large bowl. Make a well in the centre of the dry ingredients. 4. 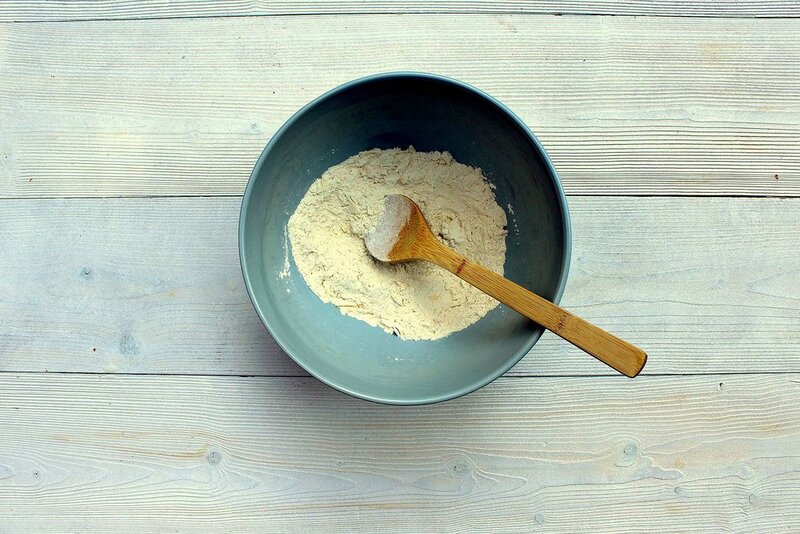 Beat sugar and butter together in another bowl with a wooden spoon until smooth, add to dry ingredients. 5. Add egg and vanilla extract and mix well until combined into a dark batter. 6. Spread batter over pears and bake in oven for 20-25 minutes until crusty and puffed up. The pudding should still be slightly gooey inside. 7. Allow to cool slightly and eat lukewarm, with chocolate sauce, cream or ice cream. Younger children may prefer their pear cut into smaller chunks. Break 150g dark chocolate into pieces and melt in a bowl over simmering water, add a tablespoon of honey and a knob of butter and stir until combined and glossy. Slowly whisk in 100ml of warmed (but not boiling milk). Can be made in advance and reheated when ready. Pears are good source of dietary fibre, vitamins C and K and minerals such as copper and potassium. There are over 3000 varieties of pears grown around the world. *Percent Daily Values are based on a 2,000 calorie diet for an adult. Your daily values may be higher or lower depending on your calorie needs. Infants and Toddlers will need less calories according to their age. 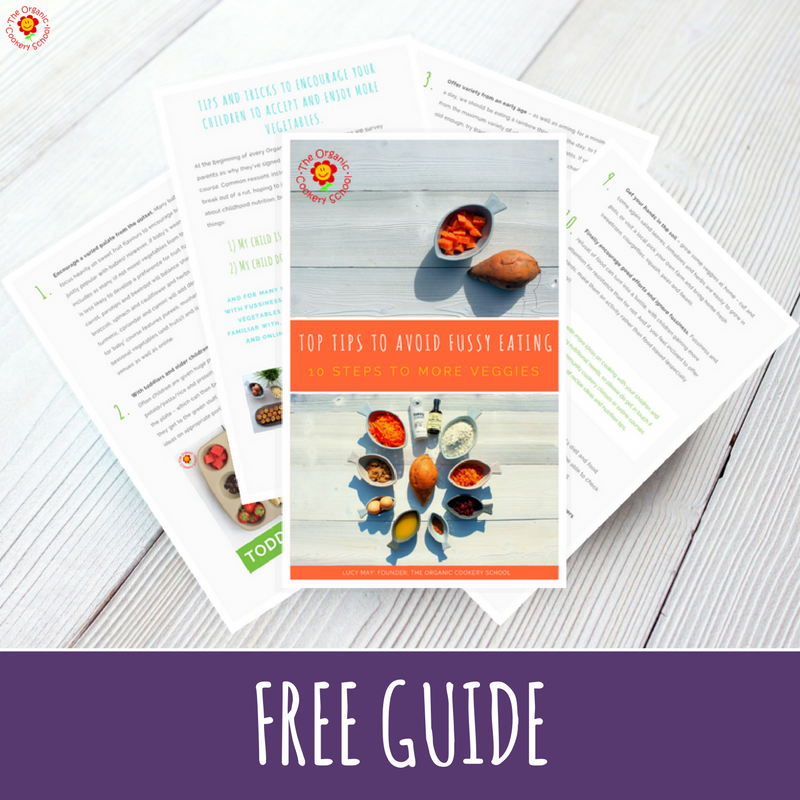 Click here for advice on how many calories your child needs. 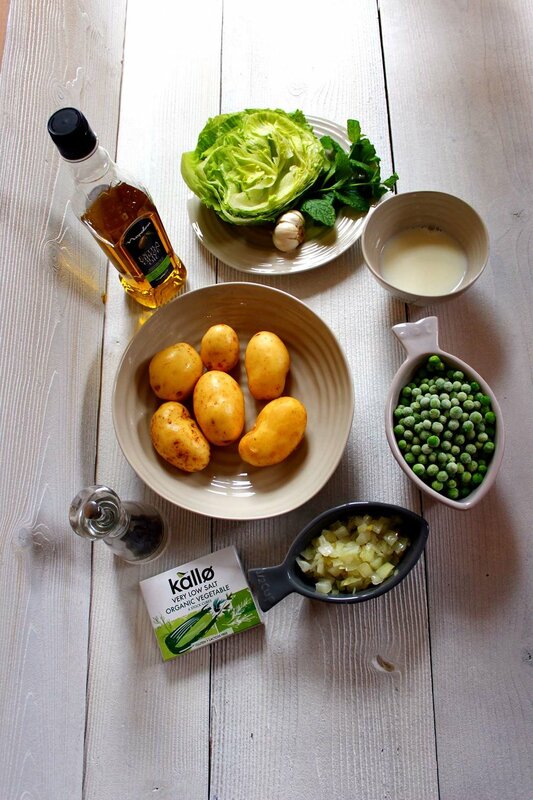 Try this if you’re making our potato, pea and mint puree for baby – it’s delicious and delightfully green. Also known as Mean Green Soup, we’ve yet to meet a child who doesn’t ask for seconds. And we’ve heard that lettuce has soporific qualities – perhaps a good sleep inducing supper. 3. Heat one tablespoon oil in a large pan and add onions and sweat over a medium heat for 3 minutes. 4. Add diced potato, stir and place lid on pan, sweating for a further 5-10 minutes, stirring occasionally. 5. Add peas, lettuce, stock and garlic (if using). Bring to a simmer and cook for a further 5-10 minutes, until potatoes are completely soft. 6. Allow to cool slightly, then add milk and mint and blend until smooth. Season with pepper to taste. N.B. Children should always be supervised when cooking, and an adult should oversee the use of heat as well as all preparation involving sharp utensils. This basic soup can be varied with whatever vegetables are in season. Swap potato for sweet potato, butternut squash or pumpkin, and onions for spring onion or leek. Soups can be thick or thin. A thin, clear soup is often referred to as a consommé. The potatoes and peas in this recipe which are blended together give this soup a thick consistency which is filling and satisfying. 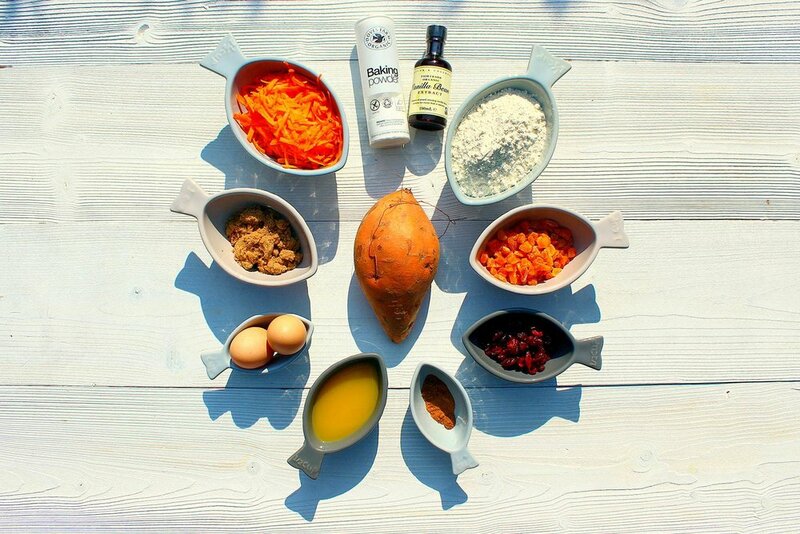 The apricots in this mix make these muffins – which are low in added sugar and full of natural sweetness from sweet potato, carrots, orange juice and dried fruit. We made them in standard muffin cases here, but they are perfect as mini muffins too – split the mix and have some mum and baby/toddler-sized ones. Perfect for lunchboxes and freezable. 1. Preheat the oven to 180 C.
2. 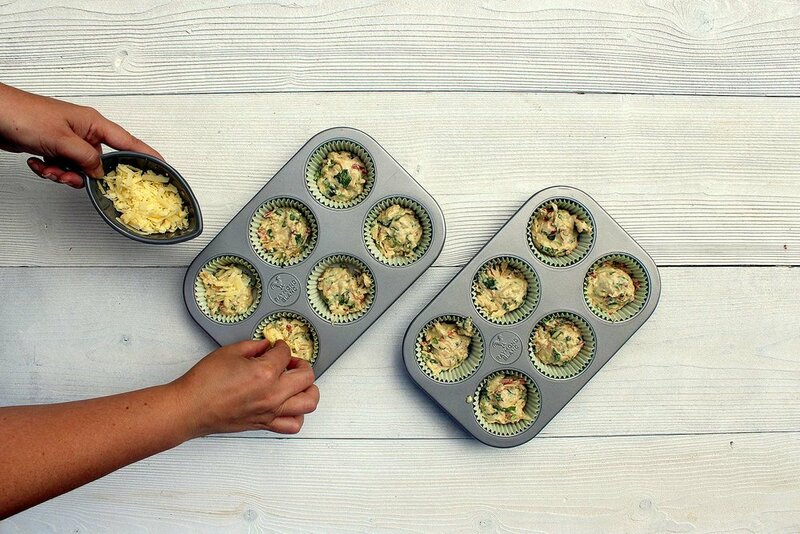 Line a muffin tin with paper cases. 3. 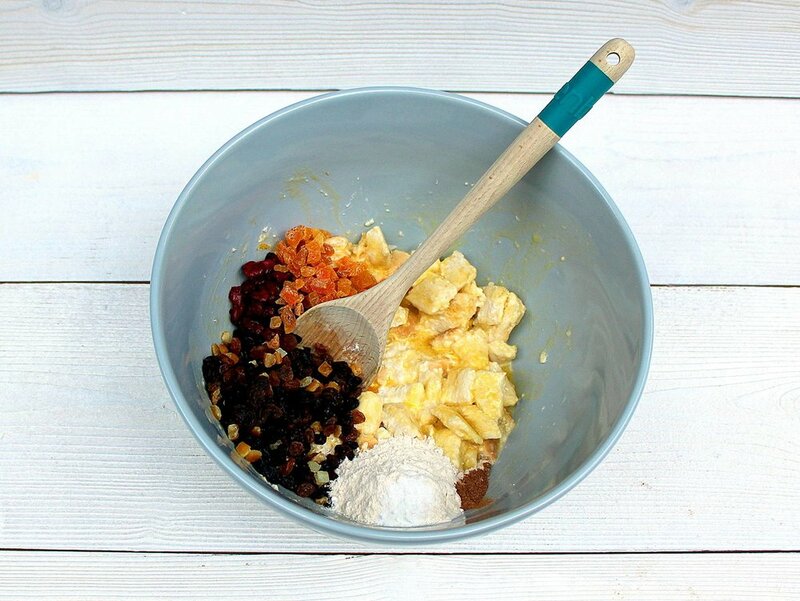 Combine all dry ingredients (flours, spices, sugar) in a large mixing bowl. 4. 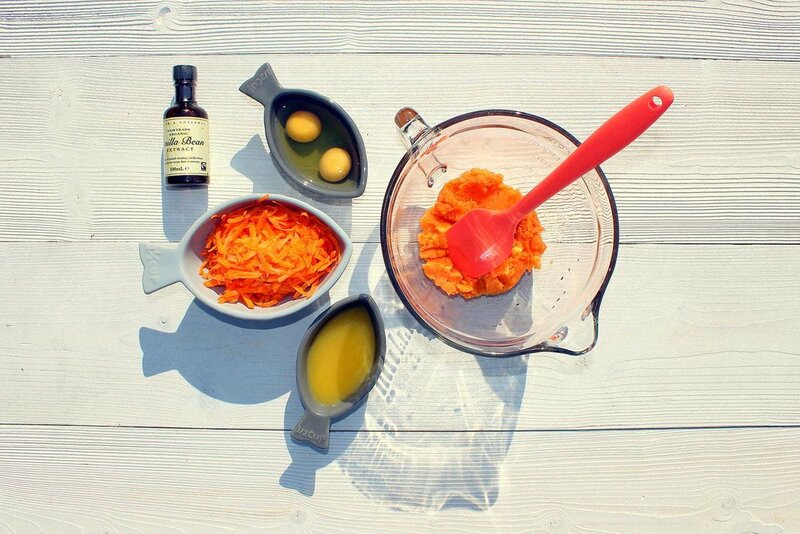 In a different bowl, mix together the ‘wet’ ingredients – mashed sweet potato, eggs, vanilla, carrot and just over half of the orange juice. Save the rest of the orange juice. 5. Chop apricots with scissors or a table knife. Stir through wet ingredients. Add the cranberries. 6. 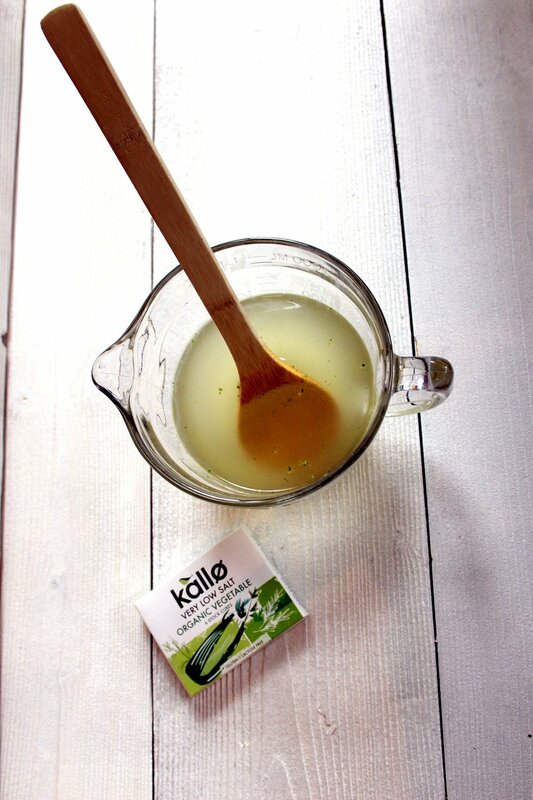 Tip wet ingredients into dry mix and stir with a tablespoon or flexible mixing spoon. 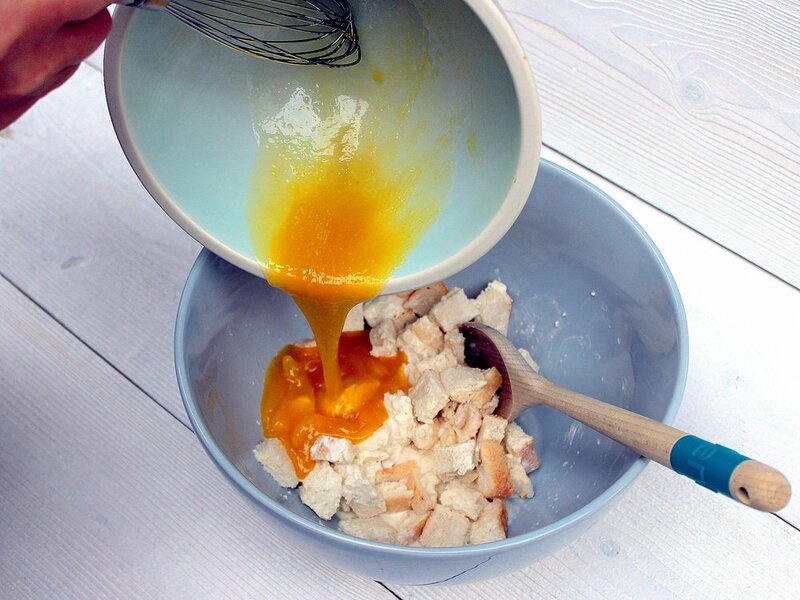 If the mixture seems a little dry add some extra orange juice – it should have a loose dropping consistency. 7. Portion into muffin cases. 8. 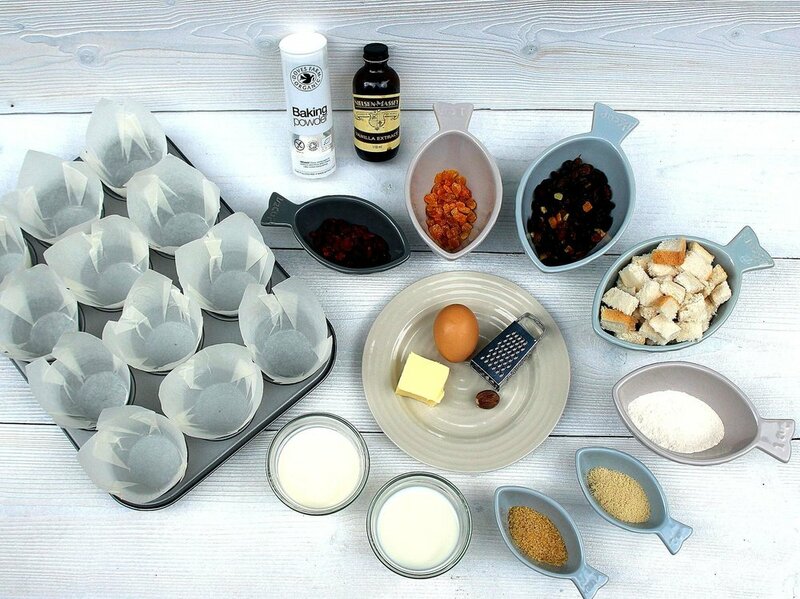 Bake in the centre of the preheated oven for approximately 20 minutes, depending on the size of your muffin cases. (or until the top of the muffin bounces back when touched). 9. 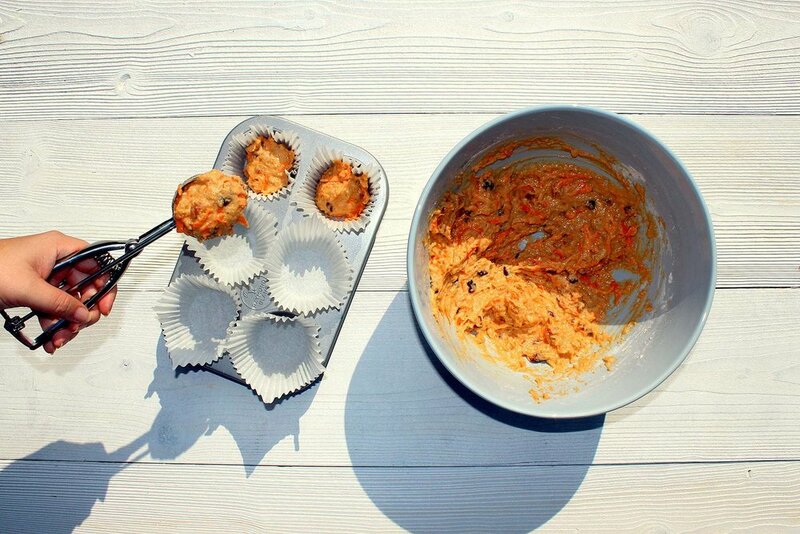 When ready, take the muffins out of the oven and allow them to cool for 5 minutes in the baking tray. * Adult supervision is required for all chopping, and use of ovens. Sweet potatoes are an excellent source of vitamin A (in the form of beta-carotene). They are also a good source of vitamin C, manganese, copper, pantothenic acid and vitamin B6. Additionally, they are a good source of potassium, dietary fibre, niacin, vitamin B1, vitamin B2 and phosphorus. 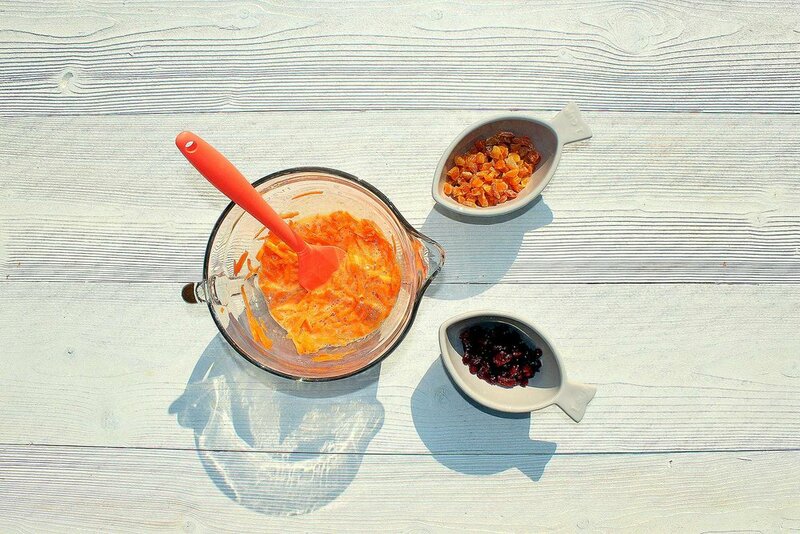 Swap chopped apricots for any other favourite dried fruit – cranberries, raisins, even chopped prunes! There’s something pretty unique about these biscuits – our very anti-tomato 10 year old loves them! As does pretty much everyone who’s made them in our community classes (even fussy eaters!) They can be thrown together in minutes, require pretty much store cupboard staples (just need to make sure you have a couple of spring onions to hand) and are perfect blw or lunchbox staples. 1. Preheat the oven to 180°C and line two baking trays with baking paper. 2. Measure flour into mixing bowl and add paprika and butter. Rub the butter into the flour mix with your fingers. 3. Cut spring onions into small pieces with scissors and add to flour & butter mixture. 4. Add grated cheese and stir through, then add 4 tablespoons of tomato juice/passata and mix well with a spoon. If it isn’t sticking together then add a little more tomato juice until the mixture becomes a smooth dough. 5. Tip dough out onto a floured surface and roll to about 1 cm thickness with rolling pin. Cut into shape with scone / cookie cutters. Place biscuits on the baking tray with a little space between them. * N.B. Children should always be supervised when cooking, and an adult should oversee the use of heat as well as all preparation involving sharp utensils. The English word “tomato” comes from the Aztec word, “tomatl”. Tomatoes are full of health: A good source of vitamins A, C and E tomatoes also contain potassium which may help lower blood pressure and calcium which is vital for healthy bones and teeth. Here’s another low sugar lunchbox treat, which the kids will love making. Dead simple, packed with veggies and naturally sweet with very little added sugar. We regularly make these in our Little Foodies toddler cookery classes, and everyone loves them. Need any further excuse to try them? Carrots are rich in beta carotene which is converted in the body to vitamin A. This nutrient is used to strengthen the immune system and to ensure good eye health. Courgettes are also a good source of vitamins A and C, as well as folate and potassium and fibre, which help to ensure a healthy bowel and prevent constipation in little ones. 2. 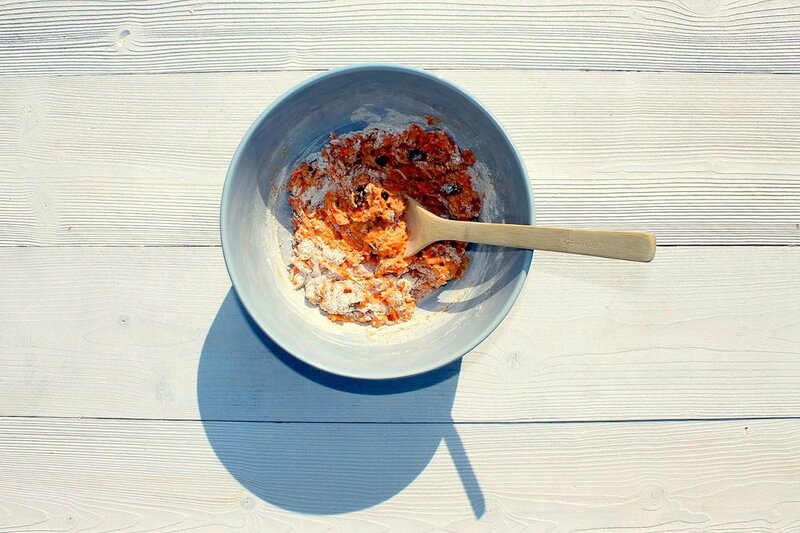 Measure dry ingredients into a mixing bowl (flour, dried fruit, spices, baking powder and sugar). Mix to distribute the spices evenly. 3. 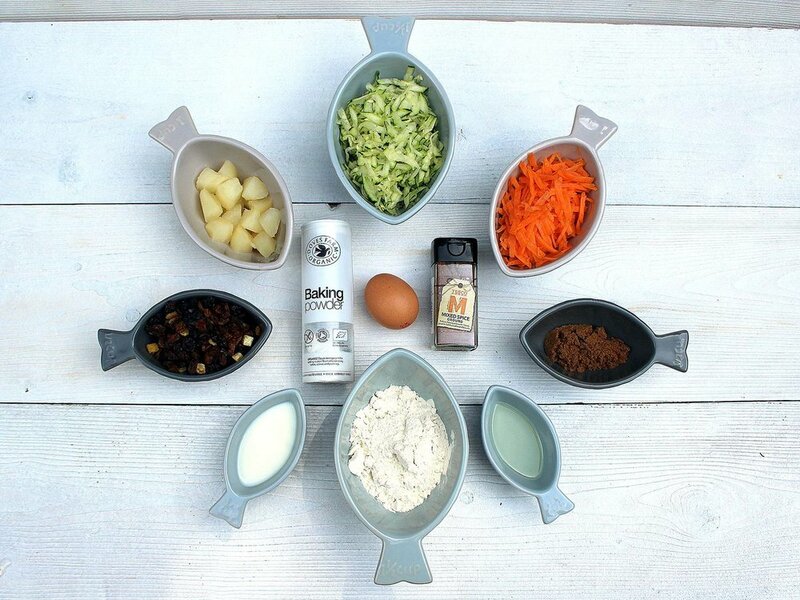 Measure wet ingredients into a separate bowl or jug (egg, oil, milk, grated carrot, grated courgette). Mix thoroughly. 4. Tip wet mixture into dry mixture and stir gently until all dry ingredients are incorporated. 5. 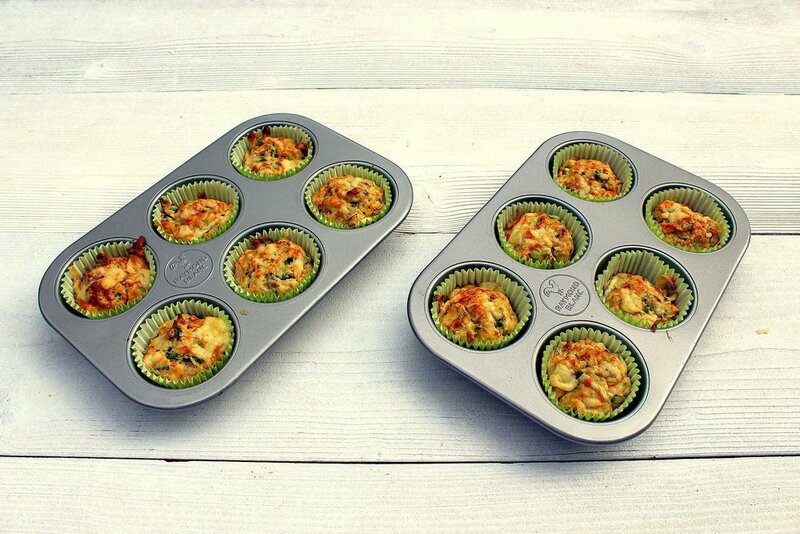 Share between two lightly oiled loaf or muffin tins. 6. Bake for 25 -30 minutes (loaves) or 15-18 mins (muffins). Check with a skewer – if it comes out clean and dry your cakes are ready. Optional: Ice with cream cheese frosting when cool. Try changing the pear for another fruit or your choice. Apples, plums and peach would work well. Courgette (also known as Zucchini) contains more potassium than bananas and are a rich source of vitamin C and manganese. Carrots although usually orange in colour can also come in purple, red, white, and yellow varieties. The human body turns beta-carotene from carrots into vitamin A. Vitamin A is important for the health of our vision (including our night vision) as well as our bones, teeth and skin. If your children are bored of sandwiches, these are great in lunchbox ( perhaps with some cooked chicken or a boiled egg for extra protein). Loved by toddlers, fussy eaters and baby-led weaners they freeze perfectly and are our secret weapon for sneaky some extra veggies into our little ones diets. 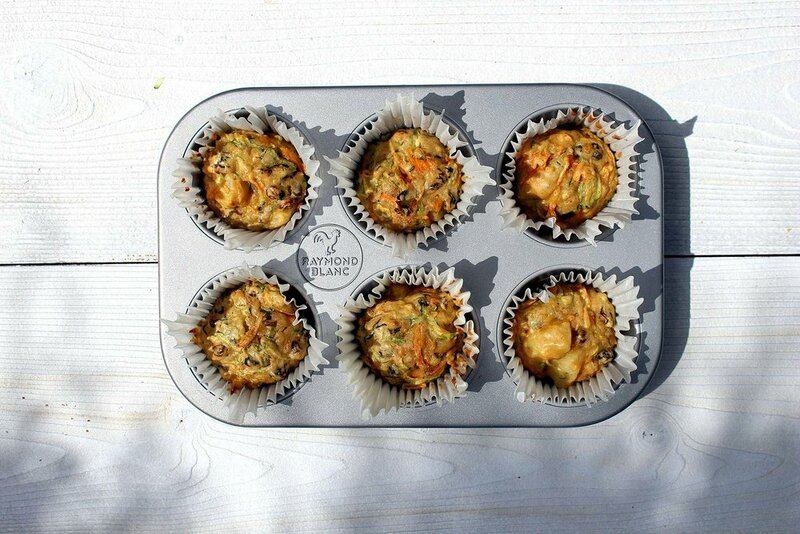 We’ve made these as full sized muffins, but they work just as well as mini muffins for babies and toddlers. 3) Mix dry ingredients (flour, baking powder, nutmeg) in a large milk bowl. Stir through two thirds of grated cheese. 4) Shred spinach with scissors. 5) Measure oil and milk into a large measuring jug. 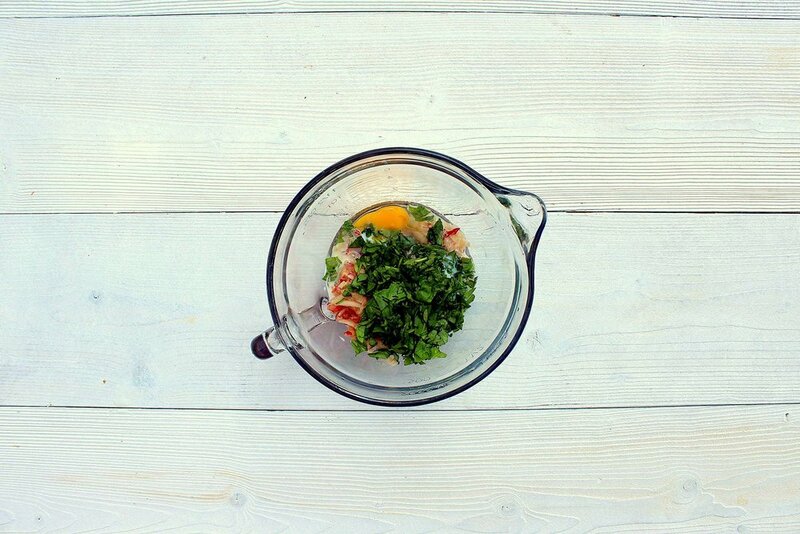 Add egg, grated apple and spinach and stir well. 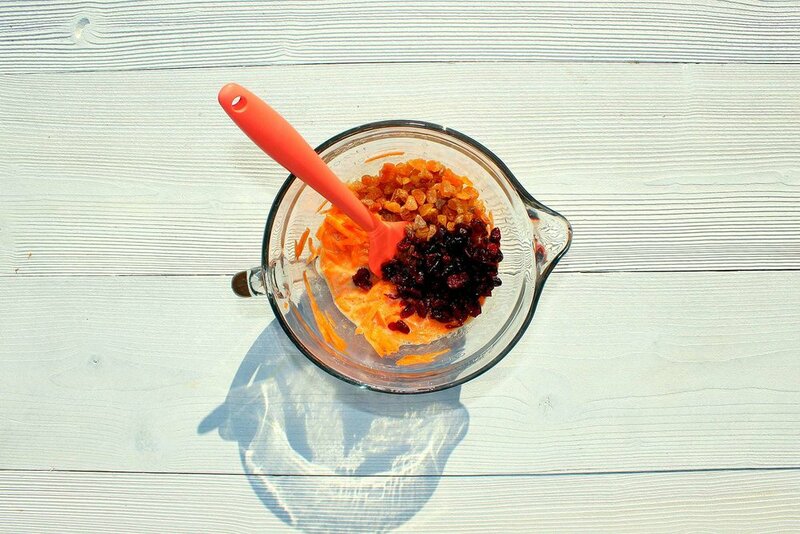 6) Pour wet mix into dry ingredients and lix lightly. 7) Portion into muffin cases and top with left over grated cheese. 8) Bake for 12-15 mins or until a skewer comes out clean. 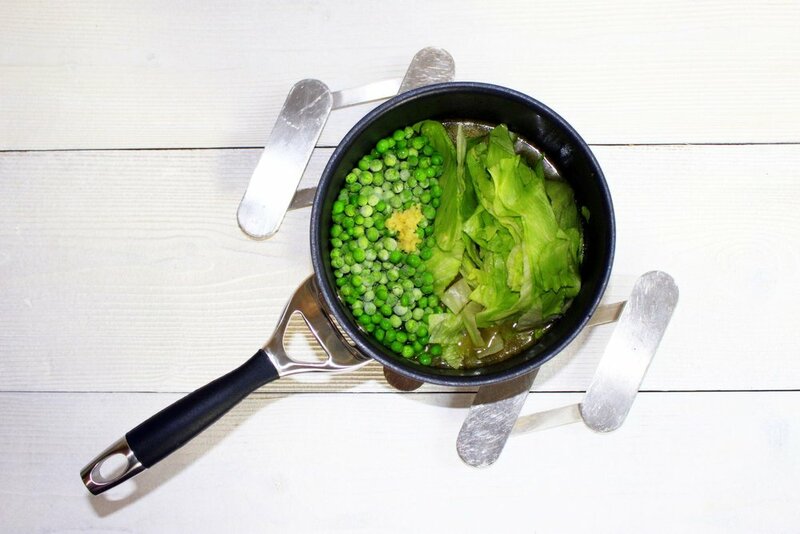 Another toddler friendly veggie smuggling dish – get your kids grating the courgettes and squeezing out the excess water, and throw in some cooked new potatoes for a substantial veggie side. Perfect for BBQs or summer lunches, just double or triple the quantities to feed a family. 1. Preheat oven to 190 C.
2. Grate courgette on to a clean tea towel or several layers of kitchen towel. Squeeze to wring out water. If the courgette still feels damp, repeat. 3. In a mixing bowl, lightly beat egg into yogurt with a fork, then crumble in feta cheese. Add black pepper, sweetcorn and grated courgette and half of grated cheddar and mix well. 4. Spoon into prepared baking dish. 5. Mix remaining grated cheddar with breadcrumbs and sprinkle on top of courgette mix. 6. Bake for 20-25 mins until bubbling and golden brown. Allow longer for a double quantity. 7. Allow to cool for 5 - 10 minutes before serving. Swap sweetcorn for peas, and add a teaspoon of chopped mint. Or added cooked new potatoes or cooked bacon to make a meal. Courgettes (also known as zucchini) are rich in Vitamin A and potassium. They are normally a bright dark green but can also be golden yellow. Another recipe on our ‘most popular list’. This basic tomato sauce is packed with flavour and can be blended smooth or chunky depending on your family’s preferences. It’s a great base for pizzas, pasta, bolognaise, lasagne, chilli and anything needing a rich tomato base. And look at the veggies we are sneaking in! 1. Chop onion and pepper into grape sized piece and dice garlic finely. 2. 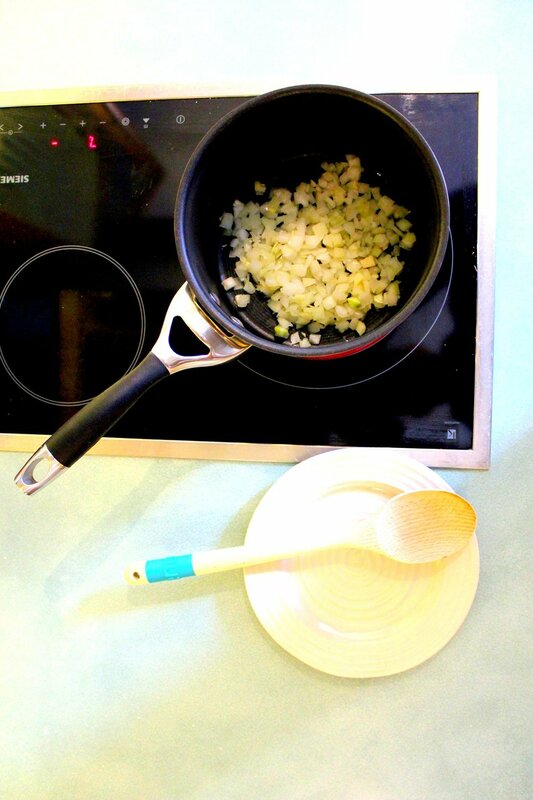 Fry onions and garlic in oil over a medium heat until the onion starts to soften. Add pepper, carrot and courgette and cook until the vegetables are soft. If necessary add a little water to pan to prevent sticking to bottom of pan. 3. Add chopped tomatoes, puree, herbs and balsamic vinegar and bring to a bubble. Reduce heat and simmer for 10-15 minutes until sauce thickens. 4. Blend into a smooth or chunky puree. Delicious served over pasta. Makes an excellent tomato base for pizzas. Can also be used as a sauce for chicken or fish or used as a dip for vegetables and pitta bread. Freezes well. 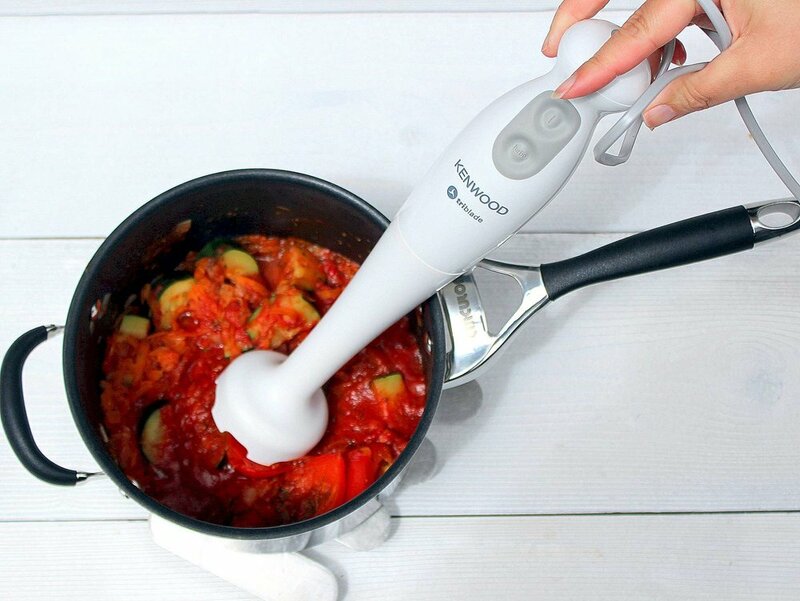 Add other coloured peppers, aubergine, celery, a handful of parsley and /or basil to your sauce… a great way to get children eating some healthy veg. If you don’t have balsamic vinegar, substitute for a tablespoon of sugar. Tomatoes are a great source of vitamin A and C.
Although the tomato is closely associated with Italian and Mediterranean cooking, the tomato originally comes from America and was only first introduced to Europe in the 16th century.